Mars is a planetary destination that so far has only been reached by a handful of countries including the United States, the former Soviet Union and some countries in Europe. But soon, another nation may finally take its place on that list as well – India. Having already successfully sent its first unmanned probe, Chandrayaan 1, to the Moon a few years ago, India is now setting its sights on a much more distant goal, Mars. 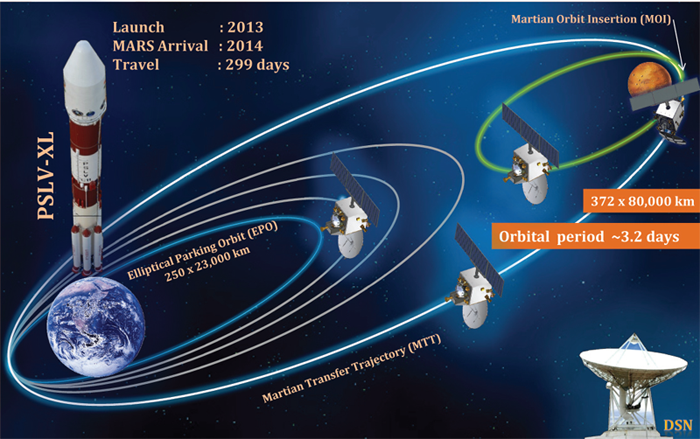 The Mars Orbiter Mission (MOM), also known as Mangalyaan, is scheduled to be launched by the Indian Space Research Organization (ISRO) on October 28 and arrive at Mars in September 2014. 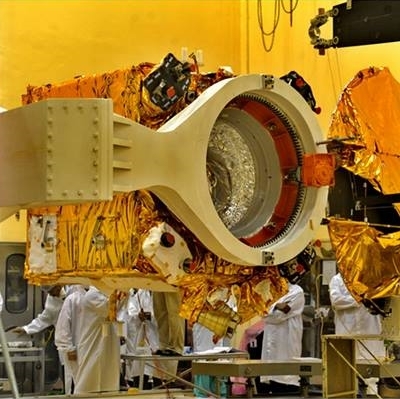 As an upgraded version of Chandrayaan 1, it will study the Martian surface and atmosphere from orbit with five payload instruments, including the Lyman Alpha Photometer (LAP), the Thermal Infrared Imaging Spectrometer (TIS), the Mars Exospheric Neutral Composition Analyzer (MENCA), the Mars Color Camera (MCC) and the Methane Sensor for Mars (MSM). Of particular interest is the search for methane in the Martian atmosphere, as it is a gas primarily produced by microbes, as well as active geological processes, here on Earth. Various ground-based observations and measurements from the orbiting Mars Express spacecraft have indicated the presence of methane on Mars as well, but those findings are still hotly debated. The detected methane plumes are seemingly very localized and intermittent in a few regions. The Curiosity rover has not detected any methane yet, although it is equipped to do so, but it is also not close to any of the purported “hot spots” either. Communications and navigation support is being provided by NASA’s Jet Propulsion Laboratory. Responding to concerns that the U.S. government shutdown could jeopardize the mission, ISRO stated in a press release: “NASA/JPL authorities have reaffirmed support for the Mars Orbiter Mission as planned and stated that the current U.S. government partial shutdown will not affect the schedule of Mars Orbiter Mission.” Whew. It is an ambitious undertaking, and if successful, will join a now-growing list of such missions; there have been many failed attempts to reach the Red Planet, but the trend seems to be changing after multiple successes in more recent years. Godspeed, MOM! More information about MOM is available here. Paul Scott Anderson has had a passion for space exploration that began when he was a child when he watched Carl Sagan’s “Cosmos.” While in school he was known for his passion for space exploration and astronomy. Then, in 2005 he began to detail his passion for the skies in his own online journal. While interested in all aspects of space exploration, his primary passion is planetary science. In 2011, he started writing on a freelance basis, and currently writes for Examiner.com. He has also done supplementary writing for the well-known iOS app Exoplanet. I am a great enthusiasist of space science and it gives me thrill watching your programs.